Are you tired of those realistically painted scenes? 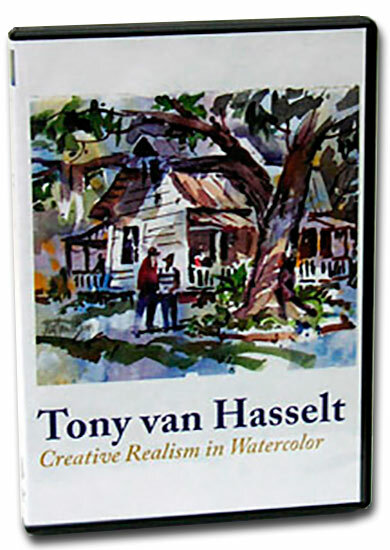 On this DVD, you will see me convert a line drawing of a southern dwelling and live oak into a sketch of light and dark patterns, first deciding on the light direction and then, with just a mid-value gray, painting the shadows and dark shapes to make the scene and shapes “readable”. In the next phase, I show how to create non-objective underpaintings on top of which – believe it or not – almost ANYTHING can be superimposed. To prove that point, the first scene is painted in full color on a sheet of clear acetate and placed over several underpaintings, with amazing results. However, I always make clear that I do not usually paint on acetate except in this case to show how an actual subject can be placed on a non-objective underpainting. Therefore, to demonstrate this approach, I use one of the just completed underpaintings to create the same subject on it, this time in full color. But wait, there is more! Next, I like to make you aware of the importance of negative shapes, by using another underpainting to coax an autumn forest scene into existence. When we do this during my workshop, I suggest some practice on drawing paper before tackling it on an underpainting. Last, a gallery of my creative examples completes this DVD. Now it is your turn. Have fun exploring this technique! $35.00 includes mailing in the US. $45.00 includes mailing and handling international orders.